Currently celebrating an enormously well deserved and a titanic rise in popularity, The Struts, originally from Derby, have recently released their newest single, “One Night Only”, and everyone is loving it! The talented members include: vocalist Luke Spiller, guitarist Adam Slack, bass player Jed Elliott and Gethin Davies on drums. Together the fabulously flamboyant faction has been described as being, “unabashedly over the top retro-fetishist classic rock” and glamorously dangerous. Larger than life, mesmerizing, singer/songwriter Luke Spiller, maintains command of one of the most bewitching, angelic and alluring voices in the industry today and his passionate music and ingenious lyrics along with co-writer Adam Slack’s, defies imagination. His persuasive attitude and tantalizing stage presence has caused Spiller to be designated as “the musical love child of Freddie Mercury and Mick Jagger”. Coming from a Christian upbringing in Bristol, Spiller’s initial exposure to music was mainly gospel. That is until he discovered Michael Jackson, who inspired a desire in him to become a contemporary dancer. Finally influenced by Queen, Led Zeppelin, and AC/DC, he began playing in bands as a teen where he first started singing. The band has appeared on Jimmy Kimmel Live, Late Night with Seth Meyers, and has opened for artists including The Rolling Stones and Guns and Roses. Just coming off of Festival d’e’te’ de Quebec along with The Who, while performing for a crowd of 80,000, and set to appear main stage in Japan at Summer Sonic 2017 on August 19th, I was able to catch Luke Spiller on some mystical Island in France during a song writing session with band mate Adam. He was not only one of my favorite interviews ever, but also one of the kindest persons I’ve ever spoken with. His answers were brilliant and creative. Luke Spiller is a truly glamorous, visionary…. Louder Than War: So you are off to Japan? Yes we are. We’re doing the Summer Festival for the second time, and we’re doing the main stage this year, so it should be great! So we can’t wait. We love Japan. We’ve been there quite a few times. Let’s talk about your newest song, “One Night Only”, what inspired that song? A lot of it really came from touring around the state’s, pretty much for two years straight. We sort of quickly realized how much responsibility we had to our audience. We wanted to give them their money’s worth and more as well. I think lyrically that’s pretty much what it’s about. It’s kind of like a big thank you to our fans, latent with a lot of typical Strut-like imagery and theatry. The people are really loving it. It is an awesome song. When you’re on stage and performing, I know that the music is important to you, but I was thinking that playing the music becomes second nature to you. What do you concentrate more on, the music or the attitude? It’s got to be the music, first and foremost, with everything with this band. It’s the music, and then everything else is secondary. In a lot of ways equally important is the outfits, the make-up, and choreography that goes into the show, our visuals, and our videos, but first and foremost you’ve got to have great songs. That’s what we always strive for. I’d definitely say the music. So, the attitude kind of comes from that. Without the music we have nothing. Was singing a choice or a destiny? It’s quite strange, when I look back I really wasn’t interested in singing until what I considered to be quite late, until my mid-teens really. I was interested in dance and drama for quite a few years. I kind of thought that that was where I was heading, for some time. As soon as the Struts formed, you kind of start gaining traction. Well, I guess I’d be selling myself cheap if I didn’t admit that it was destiny in many ways. I know that you faced some challenges during the early part of the band. Getting to where you are today, what was the biggest challenge that you had? I’d definitely say we were without a label and management at one point. Even before that we were kind of well known amongst our fans, but we really struggled to get somewhere in our native country. In a lot of ways that’s still happening now. Luckily we really landed on our feet and we found ourselves in the states with a fantastic label that really believed in us. We’ve just been working really, really hard. I’d have to say yeah, it was kind of like the early stages, trying to find the right people to represent us, and the right label to get behind us. If you could have your ultimate stage fantasy, what would have to happen? I don’t really have a stage fantasy as such. I mean I know where I’d love to play. I’d love for this band to get to the point of stadiums and maybe be the first band to go into space and broadcast to every single person on planet Earth. I think that could be cool. Or if there was a galactic festival in space, and all the different alien planets got together and chose one band to represent their planet, I would want The Struts to represent planet earth. I think that it should definitely be you. I’ve got your vote then? Absolutely, you certainly do! If I ever get involved in anything galactic, you’re my first interview. I’ll bring my space suit. Yes! So, what’s the craziest thing that’s ever happened to you live? I guess our recent experience is probably playing is one of the most craziest. Playing directly with ” The Who” in Quebec, was definitely crazy on a few levels. Just for the sheer size of the crowd, it was massive and it was one of those real, surreal moments, you look out and it’s literally just a sea of people. I guess the crazy thing about it was that myself and the band, we weren’t really overwhelmed by it. We have done a lot of big crowds now, and we can start to kind of enjoy ourselves. It was really exciting but yet we really enjoyed it. So that’s probably one of the most craziest moments we’ve had for sure. Do you have a song that never fails to evoke emotion when you listen to it? Oh yes, I’d say “Never More’ by Queen. That kind of always gets me. I mean there’s loads but if I had to put one of them, it would have to be that one. What do you want to be remembered for, and you don’t have to die to do it? The second greatest frontman in the world, right after Freddie Mercury. In between Freddie Mercury and Steven Tyler. You’re right up there. Do you have a prediction of where you and the band will be in the next five years? Honestly, I have no idea. The last five years has been sort of a quick realization in this business and you have to take every day as it comes. You know the most important thing to us is, creating quality music, and giving the best show that people have ever seen. What happens from now, again, you mentioned earlier to leave it up to destiny. What is the most annoying song in the world to you? Annoying song?….I dint know. I don’t really have like a big thing about that. I tend to love all music, in all it’s forms. Nothing really grinds my gigs. It’s normally the artist that pisses me off not their music. Well then, who is your favorite artist? I love The Stones, Queen, obviously The Beatles, I’ve been listening to a lot of Oasis, I’ve been listening to a lot of Scott Walker recently, which is really interesting. I’ve been listening to a lot of Scott Walker and a lot of Electric Light Orchestra. I tend to really enjoy that. I’ve been listening to a lot of The Kinks lately. For some weird reason when I listen to The Kinks I can’t help but being given lots of imagery of the UK, sort of like England, home, and everything that’s associated with their songs. It’s kind of like my go to artists when I’m feeling a little bit homesick, or slightly sentimental. What advice would you give to baby Luke, knowing everything that you know now? I’d say work hard, don’t stress out about where you are going to get, or about how long it takes. These things take time. If my future self would have told myself when I was 18, how long it would take for my band to kind of get to this point, I would have been quite shocked. I would say enjoy the ride, and enjoy everything that comes with it. At the end of the day if you can’t do that, then what’s the point in doing it? Cool answer. Would there be anything else that you’d want to promote or talk about that I haven’t spoken about with you? Actually me and Adam are currently in Jersey, which is this beautiful island off the coast of France, and we are writing and recording some tracks, with some fantastic produces, who are currently outside throwing around a little Nerf ball. Adam is running around and getting out of breath and getting very sweaty over it. We’ve got some really good material coming. We’re still working on the album, and we’re trying to do the best music we possibly can. Actually before you rang, we were just writing lyrics to a new song. So you called me at a very good time. Omg, I’m sorry to interrupt. No, no, it’s good. At the end of the day sometimes it’s good to step away and sort of reset the mind, and come back to work with a fresh perception. So thank you for this phone call, you might have just given me the most genius lyrics of all time. Yay, I hope so. A couple of fans would like to know when you’re planning on starting your own clothing line? Well actually I’m in talks already about the clothing label, but it’s going to take a while. I’m going to start very small and build my way up to that, but it should be available by The Struts merchandise website. Hopefully this year, I’ll get it going. Obviously we are busy, but It’ll be great. What would you like to see if I was going to sell anything. What would you like to see me sell? I love Glam Rock fashion, anything larger then life besides T-Shirts. Maybe capes. Capes, I think you’re the fifth or sixth person that has inquired about capes. This has been awesome, and I want to thank you so much for your time, and for letting me interrupt your songwriting. Thank you for supporting, it really means a lot. Any plans to come to the US soon? Oh yea, we practically live there. We’re actually heading back there in a week or so, to New York and will be continuing to record. 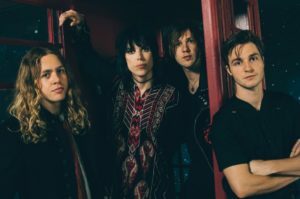 The post The Struts: Luke Spiller “One Night Only” A Thank You to the Fans – interview appeared first on Louder Than War.